Hide deals from seller "R & J Upholstery"
Hide deals from category "Furniture Reupholstery"
No limit per person. Valid toward any merchandise or services. By appoitnment only. Full value of Gift Certificate must be redeemed in 1 visit. 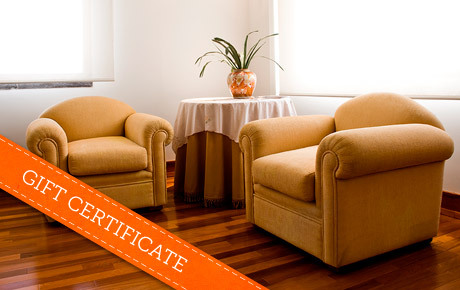 Give your living room a face-lift with 50% off a $75 Gift Certificate to R & J Upholstery in Des Plaines. This custom upholstery business offers a variety of unique fabrics to choose from as well as expert services. R & J Upholstery boasts more than 40 years of experience with residential and commercial upholstery work. They are committed to providing superior customer service, offering free in-home estimates as well as free pickup and delivery services in the Des Plaines area. R & J Upholstery specializes in antique furniture reupholstering as well as repairs and custom designs. They also sell fabrics, new furniture and window treatments for a comprehensive new look for your home. A custom upholstery business in Des Plaines offering high-quality fabrics and a skilled staff.